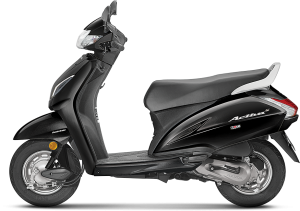 Honda, the most leading Japanese brand of two wheeler is up with their new model Activa 5g in India. It was updated at Auto expo 2018 in February. The bookings were already made for this very new model since it was divulged in February. 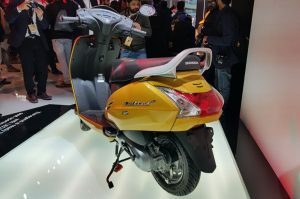 It can be observed that the outer design has not much changed compared to activa 4g model, but it has come up with many of the new features that could help make the rides more comfortable. 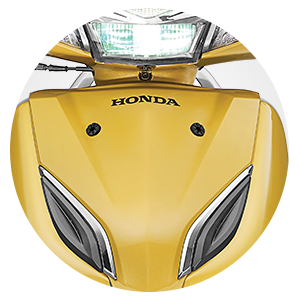 The all-new model comes with crown shining new LED position and headlamp to give a brighter ride. 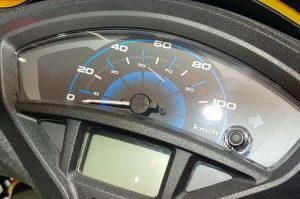 To give a more precise riding to their customers, the company is offering a digital analogue meter with eco speed indicator which tells the rider about saving fuel during rides. Your favourite Honda Activa 5G offers a 4-in-1 lock with seat opening switch which replaces the side lock to open the seat. The segment this time offers two brand new colours, dazed yellow metallic and pearl Spartan red add-on to the colours offered in active 4g. 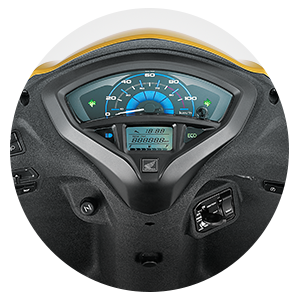 The new model now offers more storage capacity with 18L under seat storage and it is not that all it also came up with a much-needed feature of the time as you can now even charge your phone in the two-wheeler. 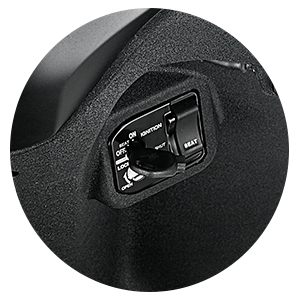 What comes as a fascinating fact is that, the all-new Honda Activa has an under seat mobile charging socket. Not only for riding but this new model goes well at servicing time also with CLIC mechanism. This comes handy when it comes to lifting up the entire rear body cover. 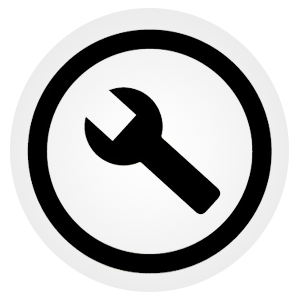 On add-on to all this, it provides us with a service indicator that keeps a check and service due indicator on the meter will remind you of due service of your vehicle. Designed with a full metal body with side stand and footstep, the all-new Activa’s design has been uniformly welded and designed to bear high loads. The vehicle’s chrome finish and elegant front make it even more attractive and attention seeking on the roads. We already have a rear hook for hanging purposes, but it gives an add on to this with a front hook. For the purpose of improving the stability, Honda 5G also offers optimum braking backed by CBS with an equalizer in it. 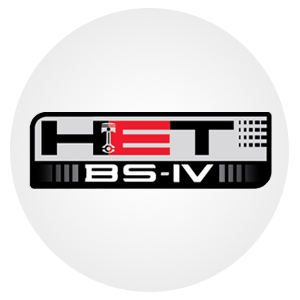 This time, the company is providing a HET engine which is known for offering great mileage. Honda Motors is offering an array of good accessories at a reasonable price accordingly. The activa’s side stand can cater a higher load capacity which is specifically designed to cater more user payload. The same has been designed and innovated with a uniform welding. What comes as an alluring fact is that, the footrest deployed with metallic paint finish is attractive in nature as well. Digital Analog Meter with Eco Speed Indicator: Looking forward to all the vital information for a seamless vehicle experience? Well, with the all-new Honda Activa 5G, users can get access to the vehicle’s mileage, service time alerts and what not. The console notifies a user with added ease when it’s the time for a service. Service Due Indicator: As mentioned earlier, now customers can leverage the service due indicator through the dedicated digital console. Benefit? Well, you can now be reminded of timely service for your vehicle. This would lead to a durability as well as a better vehicle maintenance. It’s small yet an innovative feature addition. 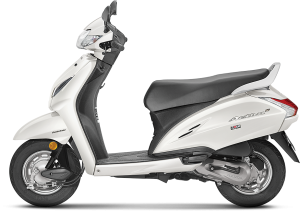 Full Metal Body: Leverage the full metal body of the Honda Activa 5G, apart from chrome backed stylish appeal, the vehicle offers a robust, comprehensive and scalable build quality to users around the country. You can also get your hands on body accessories for the purpose of safeguarding the same against any scratches. Elegant Chrome Garnish and Premium 3d Emblem: Looking forward to garnering more attention on the roads? Well, with Honda Activa 5G’s new 3D emblem, don’t worry regarding impressing your viewers. The vehicle encapsulates a great degree of pixel-perfect design tech which has been backed by its chrome garnish. 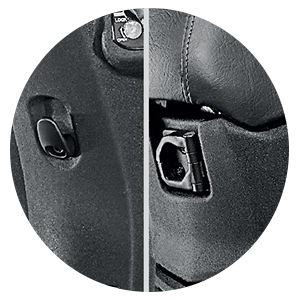 New Front Hook and Retractable Rear Hook: Tag your handbags and carrying equipment with added ease in your new Honda Activa and leverage the options. CBS with Equalizer: Central Breaking system has been provided by the company for the purpose of optimizing the breaking experience. Users can now take benefit from an array of measures Honda is taking for them to promote a healthy ride. CBS backed by an equalizer is one of the mighty additions. Het Engine (Honda Eco Technology): Compliant with the latest BSIV regulations and rules, the all-new Honda Activa 5G is breaking the stereotypes by offering agility backed by amazing mileage as well as superb performance. Therefore, HET is a one of its kind technology which has been only offered by Honda Motors as of now. 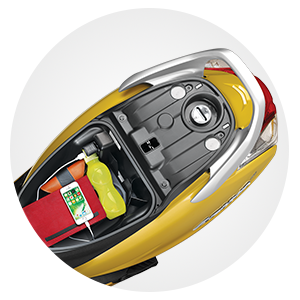 18L Under-Seat Storage: With over 18 litres of massive under-seat storage, users can now store their essential items like the helmet, phone, charger etc. under their seats with added ease. You can also get access to automatic mobile charging socket as a part of available accessory. Don’t worry about how you might carry your items from shopping. This New Honda Activa has something for everybody. Leverage the under-seat storage for the greater good and never forget to carry the essentials. Mobile Charging Socket: Charge your smartphone even if you’re on the move. For all the tech enthusiasts out there, now charge your mobile phone smartly with this new optional feature offered by Honda Motors with their all-new Activa 5G. 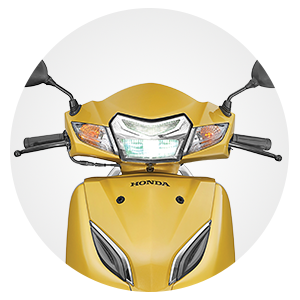 Users can choose to include the accessory in their version of Honda Activa. Thus, now you’re not required to worry about the low-battery. Clic Mechanism: What comes as an exuberant fact is that, now you can lift the whole upper part of the Honda Activa with its all-new addition i.e. click mechanism. 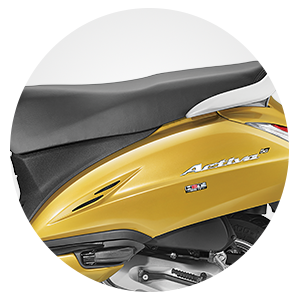 Servicing of your Activa 5G has become much easier with the inculcation of the same. The Honda Activa 5G comes handy with a length dimension of 1761mm. For width and height, the values rest at 710mm and 1158mm respectively. Talking about the wheelbase, you can obtain up to 1238mm of the same. 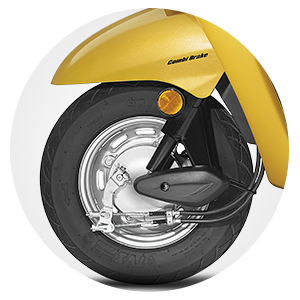 Honda is offering ground clearance of 153mm with the all-new Honda Activa. A comfortable seating has been ensured by the manufacturer with the height of 765mm. When it comes to the kerb weight, it has been kept at only 109kg. The premium array of wheels equipped with the vehicle are 10-inches in size. The Honda Activa has a fuel tank of 5.3L with a null reserved fuel capacity. The engine is known for giving a great mileage of around 60 kilometres per litre. 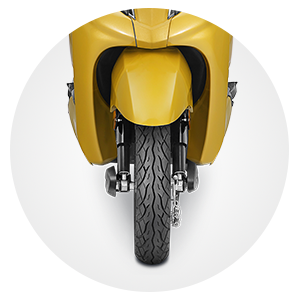 As a regular user, you can get access to a riding range of 238.5 km. 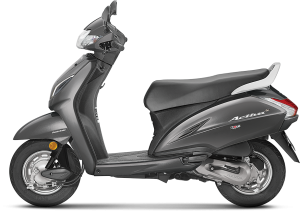 Engine of the all-new Honda Activa is a 109.2cc type. Backed by the power of one cylinder, a maximum net power of 8.11PS can be achieved. The engine has been cloaked at 7500 rotations per minute. You would be fascinated to know that the vehicle produces a maximum torque of 9Nm which has been clocked at 5500 rotations per minute. Honda Activa 5G has 2 valves per cylinder. The company is offering the vehicle with a decent fan cooled cooling system. You can also leverage its self as well as the kickstart mechanism for good. 50mm is what is the size of the bore deployed amidst the Honda 5G, a stroke of 55.6mm has been provided. Talking about the much-important compression ratio, the value rests at 9.5:1. In lieu of curbing the pollution, Honda has equipped the vehicle with a dedicated air filter for the job. The ravishing all-new model of Honda Activa 5G comes pre-packed with a battery of around 12V 3Ah. Looking forward to a led headlight which is much brighter and offers agility in comparison with the halogen unit, which has been deployed on the current scooters? Well, Activa 5G is for you. The vehicle has a tested and premium mechanism which helps in a low power consumption. This, in turn, increases the efficiency rate as well. 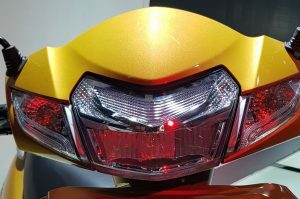 The all-new newly developed and introduced led headlamp and a position lamp are the first of their kind in the 110cc scooter segment governed by Honda Two-wheeler domain. When we talk about the top speed offered by the Honda Activa, in lieu of official data released by the company, top speed rests at a whopping 83 kilometres per hour. The engine is doing a great work in ensuring a happy ride experience for users, backed by cost-effective mechanisms. There are reportedly 8 prime colours in which the all-new Activa 5G comes handy. 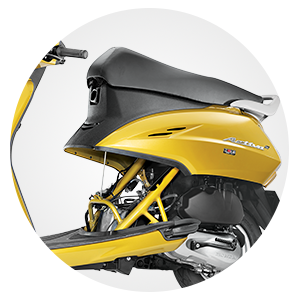 Activa in Dazzle Yellow: Talking about the first and one of the most sought-after ones is the Dazzle Yellow Metallic. The colour is suitable for all types of motor enthusiasts & it also gives a sporty touch to your vehicle. Activa in Majestic brown metallic: The second colour variant in the array is the Majestic brown metallic trim. If you wish to impress the passersby, then it is an evident choice for you. Activa in Black colour: When it comes to garnering the much-needed premium and exquisite appeal, a just Black colour variant will do just fine for you. Nothing can be fancier than a pure Black Activa 5G out over there. Activa in Grey metallic: If you’re a bit of colour picky, then you might get your hands on Matte Axis Grey metallic trim of Activa 5G. Activa in Trance blue metallic ” The 5th colour option in the list is a trance blue metallic type. 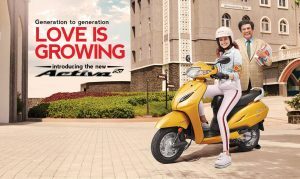 One of the most in-demand amidst the youth, the colour opens up the Activa’s world to exuberance & hence, can make others gaga over its beauty. Activa in Pearl Spartan Red colour: Then it comes to embracing the Activa’s 5G full metal body and encompassing a pixel-perfect colour design, Pearl Spartan Red colour trim can be an out of the box pick for the users out over there. Honda Activa 5G is the vehicle of future. Equipped with all the latest and premium range of amenities, users can now have a taste of ecstasy while riding their 5G. We can say that the company is doing everything in their power to innovate and woo the younger generation of the country. Hence, the introduction of features like Digital Console, Mobile Charging Socket, Bigger under-seat space, Chrome Body is there to optimize the user experience. Deriving further from Honda’s record in the country, it is expected that the all-new vehicle is all ready to rock the shelves around the country. It is expected that people will love the all-new innovative, feature-packed & ravishing Honda Activa . With every new model coming into the market, Honda is trying to add on to more modern features, bring in more colour and add glitz to the existing specifications. When will Pondicherry come in ACTIVA 5G. Pondi will never come to Activa. It’s the other way round buddy. Thanks for correcting but its ok. I got his message and understood its very well. major part of readers of this site are not English speaker. When will hyderabad come in ACTIVA 5G ? pls put the fuel lid at the back side in the next version it will b more comfortable while refueling the scooter.. In activa 5g I hope back & front shockabsorve (susspenstion) & millage will be better than 4g please replay me when activa 5g is launching I am waiting to buy 5g waiting for ur replay I love honda. This is pure speculation as there is no official information out yet. Seeing tradition of Honda Activa launching 3g and then 4g, we can expect the new gen Honda will be Activa 5g. Hoping that activated takes all the points in view of its drawbacks via customer inputs in 4G,125cc variants regarding starting problem by majority of customers, change in petrol knob from rear side rather than inside seat, space for any full helmet as it is a major safety issue, latest shock absorbing in both rear and front tires for safe and conformable rides as Indian roads are worst. If activated takes these points in activa 5G,and activa.. CNG.. No one can beat activa. Hope it fulfils this time. I am eagerly waiting as I was to book in a day for 4G. But will wait if tentative date of 5G IS GIVEN. PL At LEAST GIVE APPROX DATE OF LAUNCHING, 5G.. I am waiting for your kind reply to wait for the best. Reply to my major suggestion and query soon I am waiting to book after your answer also pl star when is CNG model launching approx date. 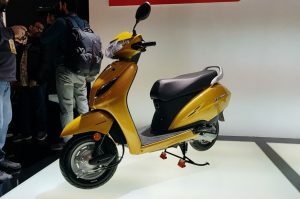 Activa 4g not having telescopic suspension and bigger wheel base othewise it lagging behind , need of updated version..
Plz.tell 5g launch date so that I can plan for new scooter rather going to book another company scooter. Improved electronic & safety features. Compare to past model. 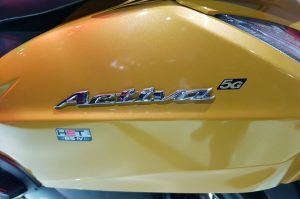 When is the launch date of activa 5G ? i am interested to buy when it will launch ? i am interested to buy Activa 5G when it will launch ? I interested to buy activa 5g when it will lunch?? I am waiting for activa 5G, when will be launche…. Sir I want to by 5G. Hope the back side shocks absorbers are of highly strong performance, for us to travel smooth. And avoid back pain. I am expecting to buy Honda 5g but should lunch early otherwise hero duet 125 is coming as dream scooter. When will we be expecting activa 5g at Durgapur West Bengal? when will the 5g in showroom ..
Activate simple meter & digital meter rate? The EMI would be 2500 to 3500. If you increase down payment, EMI will go down. Dear sir Pl launch activa as early as possible, I am eagerly waiting for it. In new activa 5g blue colour is available??? Really, I’m waiting to purchase 5G. I’m excited to buy this scooter really. When it’s going to be available in jalandhar city and is their any pre booking formalities ?…. I Will change my mind to go for other vehicle. & when it will launched in Mumbai . To know more about the exchange and latest exchange offer on activa 5g, please visit your nearest Honda dealer. I have got activa 5g and in just one week I am facing some problems. The biggest of them is that everyday when you start your bike first time you need to put it on main stand then pull choke and then kick start 2-3 times. Mind you, this exercise is for everyday. So when you start your bike by pulling choke it’s like hard starting your bike which ultimately effects engine in long term. And when you buy activa this important piece of information is not shared at that time which is like selling bikes by blindfolding the customer. I bought this from yume Honda and I would suggest to buy some other bike like TVS etc as honda is not anymore customer focussed. They are doing business on there past built image. PATHETIC. What does DLX & STD mean ??? ACTIVA 5G STANDARD HORN AND MIRROR IS SO POOR.. The Honda Activa 5G has been unveiled and there are two models STD and DLX. It looks pretty promising at first. I Want detailed specification of activa5g.